As one of many examples, we report a 4-generation pedigree with a hereditary DCM phenotype. Three affected males in the family underwent cardiac transplant, and agreed to provide samples and participate in WES. The affected individuals had tested negative on a 46-gene clinical pan-cardiomyopathy panel. Explanted hearts demonstrated cardiomegaly with marked biventricular dilatation, fibrosis and pronounced histopathological findings. WES identified rare, possibly deleterious, heterozygous variants in 13 genes, including a novel 1-bp heterozygous deletion (c.913delC) in exon 4 of BAG3. The identified variant was PCR amplified and established by Sanger sequencing. BAG3 protein is significantly expressed in striated and cardiac muscle and colocalizes with Z-discs. Knockdown studies on BAG3 in mice and zebrafish models have demonstrated a DCM phenotypes and heart failure. Here we conclude that c.913delC in BAG3 is a contributing mutation in our family, and endorse WES and SVS as powerful tools for disease-gene identification, where classical linkage studies are not applicable in terms of sample size or disease-penetrance in autosomal dominant pedigrees. 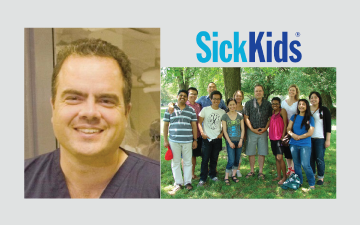 Dr. Robert Hamilton is a part of the Cardiology deparmet at SickKids where he is also the Section Head for Electrophysiology. Hamilton is cross-appointed to the SickKids Research Institute as an Associate Scientist, and runs research programs in the basic science of congenital heart block (CIHR funded) and the diagnosis and mechanisms of arrhythmogenic right ventricular cardiomyopathy (Caitlyn Morris Memorial Fund of the SickKids Foundation).